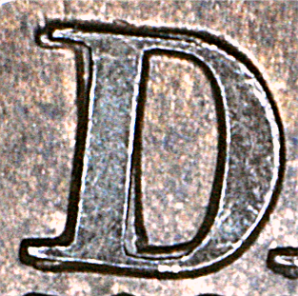 We’ve seen how the obverse and reverse punches for the Provincial cent gradually deteriorated during the process of die sinking and thereby passed flaws on to the dies. 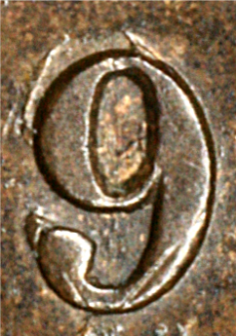 We’ve also identified seven states for the reverse punch as it was used to sink the 185- dies that would become the 1859 Narrow 9s. 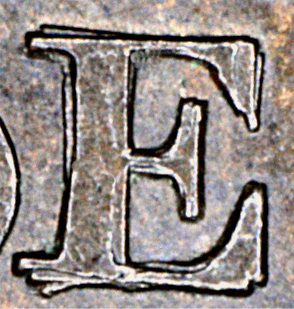 Indeed, if no changes were made to the reverse dies after they were freshly sunk, there would only be eight reverse die varieties for this date. 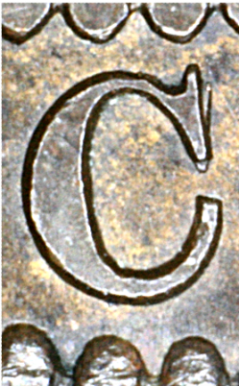 Now, we’ll see how the die flaws were sometimes corrected in the next step in the die making sequence, die finishing, and how these corrections substantially increased the number of die varieties seen in the Provincial cent coinage. 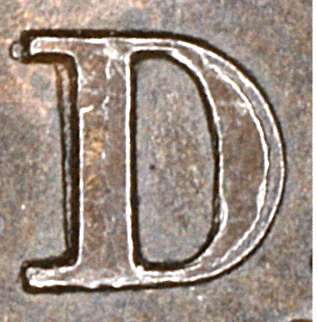 Die finishing (the process of bringing a freshly-sunk die to the final state ready for use in the coining press) consisted of repairing defective portions of the design, smoothing the die table and heat treating the die to bring it to the required hardness for coining. 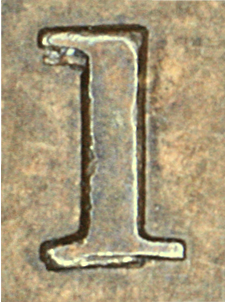 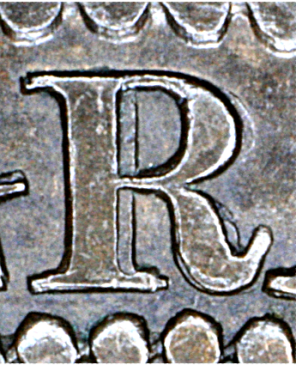 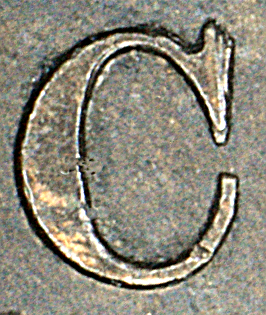 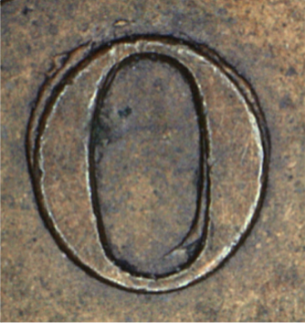 The practice of employing slightly flawed obverse and reverse punches in the production of the Provincial cent dies reflected a longstanding policy of the Mint. 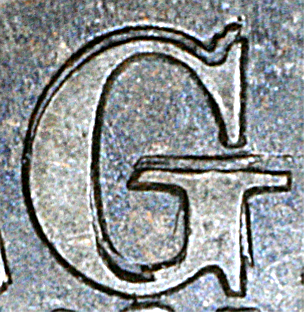 An otherwise good punch was considered too precious to be retired just because of defects like letters or numerals with missing serifs or broken arches. 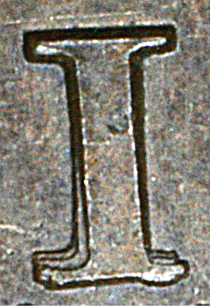 So, the broken characters were repunched in each die. 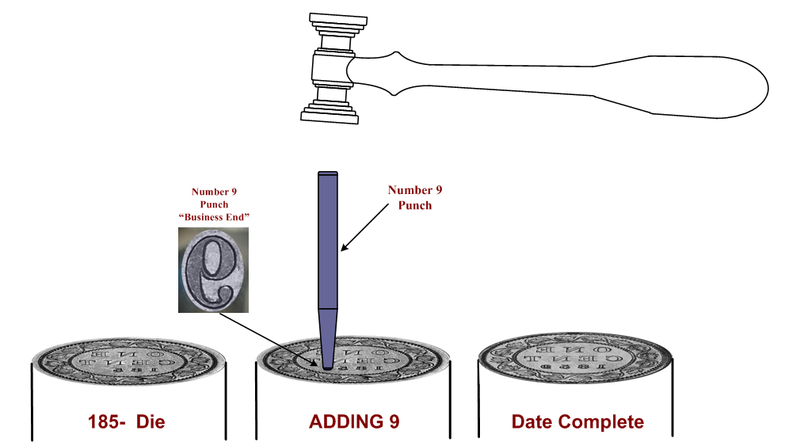 This was done, at least initially, with the same hand punches that had been used to add the legends and date to the matrices in the first place. 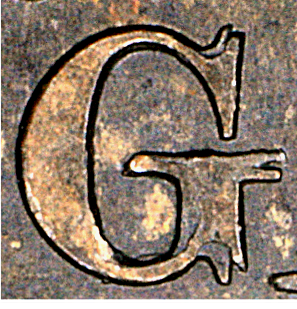 A variation on the above is where the letter punch was tipped compared to the original character being repunched and the surface of the final letter was left higher on one side than the other. 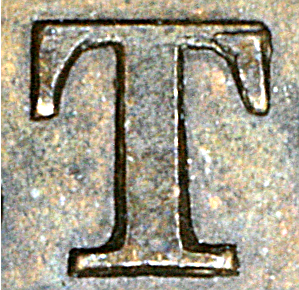 If we look at the Ts below, we find in the photo at the left the T punch was high at the bottom (low in the die), leaving the fragments of the original T top showing. 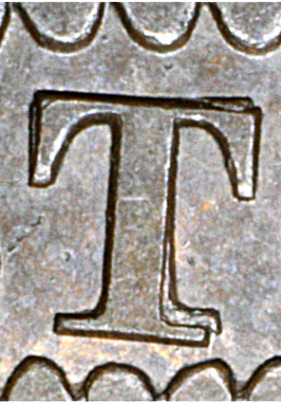 However, in the photo at the right it was just the opposite: the T punch was high at the top and low at the bottom (leaving the curved and broken bottom of the original T still showing). 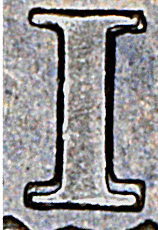 Some repunches can be unusual not only in the amount of displacement, but in the number of punch blows showing. 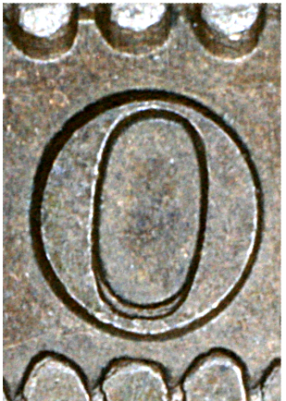 Any number greater than two is unusual. 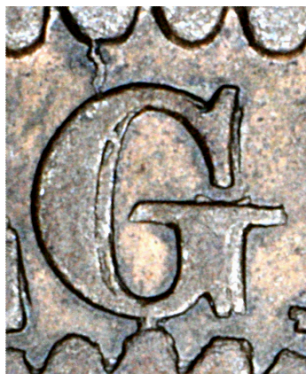 In a few cases we have clear examples where the character punches that lettered the original matrices were no longer used for die repair. 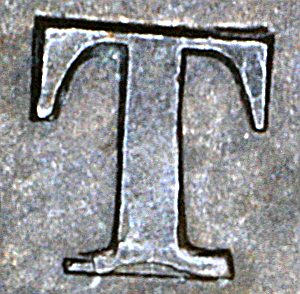 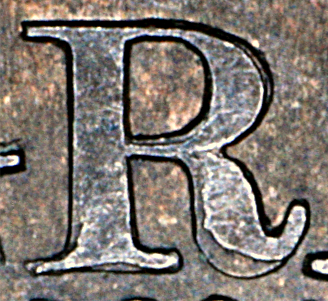 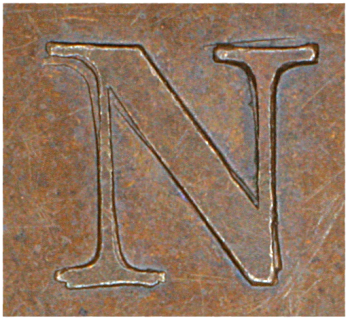 Note the serifs of the I beneath the letter in highest relief in the left-hand photo below. 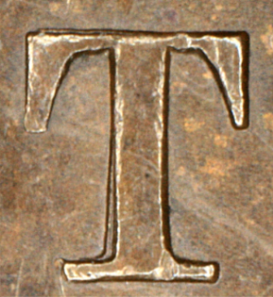 This is clearly not a simple lateral repunch, as the serifs at the top very closely line up. 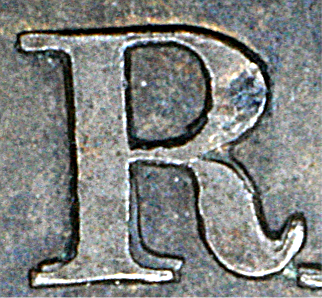 With the stop repunch at the right the original top was the large one underneath. 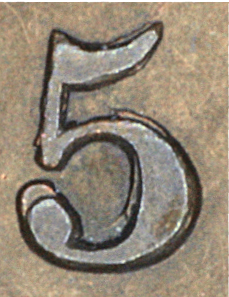 The repunching was performed with a punch bearing a significantly smaller stop. 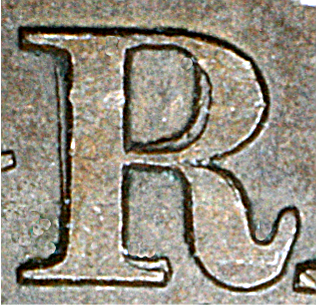 Repunches of this type can be called mixed font repunches, a term we recently coined in connection with an obverse variety of the 1881H cent. 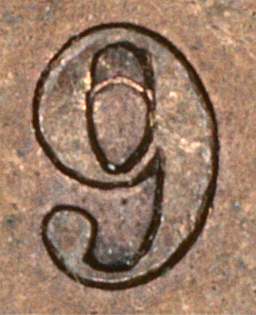 Multiple impressions of the 9 of the date can also be seen. 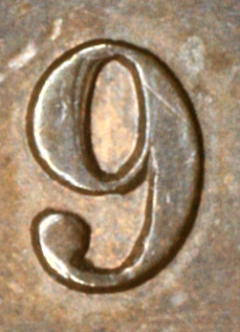 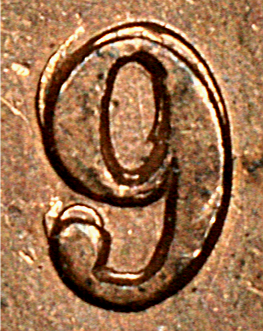 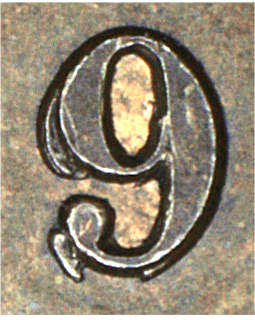 In this case, however, it should be remembered that repunching of the 9 occurred while punching the 9 into a blank space and was not done to correct a defective digit brought in by the reverse punch.